One of the elements of animation that Pixar has always excelled at that will garner them a bonafide place in history books and text books about storytelling and animation (whether you’re sick of seeing them on TV and awards shows or not) is the fact that the animators and writers in the studio are able to understand that animation is just as much a narrative experience as it is about sight and sound. As well you can also surround an animated film around sight and sound and little dialogue without overloading us with explosions and colors. Pixar has opted most of the time for soft visual and sounds (Up) while also sometimes appealing to the high adrenaline audience (Cars) and have explored their clearly defined skill for giving audiences a wonderful animated experience without filling it with dialogue and a deafening dizzying score. That is why Pixar continues to be superior over Dreamworks. They understand the use of animation and that’s why “Day and Night” is one of their most critically acclaimed and superb animated shorts. It’s a short that hearkens back to the golden age of animation and is shockingly similar to shorts like “The Dot and the Line” from MGM, and “What’s Opera, Doc?” from Warner where the creative team offers audiences an animated short that stimulated us, challenged us, provoked us, and entertained us. Music and colors told a story where dialogue could not. Disney was never quite talented in that regard in their legacy, thus Pixar is making up for it with their rousing shorts, one of which is “Day and Night” a spectacular silent animated short about the manifestations of night and day as both entities compare their pros and their cons, their appeal and their lacking, their romantic moments and their absolutely harrowing moments. Both are beautiful in their own regard, but the beauty is dependent on themselves and what the audience ultimately prefers. Offering up a collaboration of 2D and 3D animation, “Day and Night” gives us the standard breathtaking computer animation of Pixar that is merely a byproduct of two dimensional hand drawn animated forms of nature, both of whom live through sound effects and scenes from their respective time periods. Day is very upbeat and something of an upright gent, while Night is smooth and a hound dog. Day presumes to be better because he can offer something Night can’t. Night shows he can provide beauty Day can never but deep down after the hijinks and battles, “Day and Night” is really a short morality tale for the children about how we can accept and learn to love each other for our differences and embrace the new and the unique. Day and Night have different colors, different personalities, different senses of humor, but at the end of the day they’re both beautiful and both deserve to live hand in hand, and for that “Day and Night” is a highlight of 2010 sadly overlooked by many. 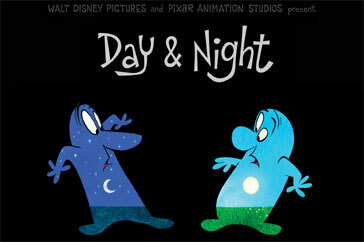 Pixar and Disney’s “Day and Night” is ultimately very evocative of the classic Warner and MGM animated experiments that appealed to all audiences and didn’t talk down to its respective theater going crowd. Pixar understands the art of animation much more than modern Disney and they show it with “Day and Night,” a brilliant short about appreciating the differences and learning to live with one anothers own unique beauty and gifts rather than focusing on the shortcomings and trying to destroy them. This entry was posted in Movie Reviews and tagged Animation, Comedy, D, Disney, Fantasy, Pixar, Short Film. Bookmark the permalink.